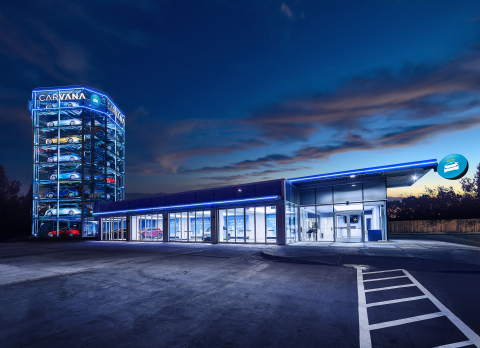 SAN ANTONIO--(BUSINESS WIRE)--Carvana, a leading eCommerce platform for buying used cars, announced today the opening of another one of its proprietary automated Car Vending Machines in San Antonio, Texas. Only the fourth of its kind in the country, Carvana’s San Antonio Car Vending Machine introduces an exciting and unique pick-up experience for customers purchasing a car from the company online. This launch marks the third signature Car Vending Machine in Texas, joining Austin and Houston. Standing eight stories tall, the glass tower matches its Houston counterpart in size. The San Antonio Car Vending Machine contains four delivery bays and holds up to 30 cars. Vehicles that have been purchased from the company’s website are loaded into the tower in advance of the customer’s pick up date. Carvana customer advocates are available on-site for support and to help facilitate a personalized and memorable pick-up experience. By visiting www.carvana.com on a mobile phone, tablet or computer, customers can search through Carvana’s online inventory of more than 8,000 vehicles, and buy and finance a car online in as little as ten minutes. Once the purchase is complete, customers living within 100 miles of the San Antonio metropolitan area can choose to receive as-soon-as next-day delivery service, or opt to pick up their vehicle from one of Carvana’s Car Vending Machines. Upon arrival at the Car Vending Machine, customers receive an oversized Carvana coin to drop into the coin slot, which activates the vending process. The purchased car is retrieved from the tower and is robotically moved into the delivery bay on an automated track where the customer then takes possession. Customers have seven days to test own the car to ensure it meets all expectations. Within that timeframe, if customers are not completely satisfied, they can return the car for whatever reason for a refund. The San Antonio Car Vending Machine is conveniently located at 5435 N Loop 1604 W. Hours of operation are Monday through Saturday from 9am to 7pm CST. Vehicle pickup at any of Carvana’s Car Vending Machines is free for all Carvana customers. For customers that live outside of the San Antonio local delivery zone who still want to pick up their car at the Vending Machine, Carvana will subsidize $200 in airfare and arrange white glove transportation from the San Antonio airport.